A paper moisture meter measures the humidity of paper and paper products. Use of a paper moisture meter can prevent costly damages resulting from paper expansion or shrinking. A paper moisture meter determines paper moisture content based on either absolute humidity or relative humidity. Absolute humidity does not take into consideration temperature, while relative humidity relies on temperature and is expressed as a percentage of the total amount of moisture possible at the current temperature. Thus, many paper moisture meter devices feature automatic temperature compensation (ATC). For paper producers, paper manufacturers, paper mills and others in the pulp and paper industry, moisture and humidity control is essential, especially during the production process, as excessive moisture can lead to warming of the paper rolls. A paper moisture meter can be used to detect moisture streaks during the paper production process as well as to identify optimal drying times. Regardless of whether paper is stored in paper rolls in paper converting plants or stacked in sheets and paper bales in commercial printing warehouses, the porous surface of paper gradually takes in moisture relative to the humidity of the surrounding environment. This moisture can be problematic, as too much moisture can cause curling, buckling or the formation of waves in otherwise flat paper products. Moisture also can prevent inks, dyes, paints and coatings from covering and saturating paper properly during printing and processing. PCE Instruments (PCE) offers digital handheld moisture meter devices for measuring the moisture content of paper and paper products such as cardboard, paperboard, corrugated boxes, kraft paper, wrapping paper, brown packaging paper, butcher paper, recycled paper, coated paper and more. Different paper moisture meter models utilize different paper moisture measuring techniques, performing moisture content tests of paper products via either destructive or nondestructive methods. Typically, a standard pinless paper moisture meter is nonpenetrating, thus allowing for the nondestructive measurement of paper water content. PCE-MMK 1 is a portable handheld digital moisture meter used to measure the moisture content of wood, paper, textiles, concrete and other building materials. This multifunction paper moisture meter also measures ambient temperature and ambient relative humidity. PM5 is a portable handheld paper moisture meter used to take accurate nondestructive measurements of the moisture content or water content and temperature of cardboard and paper products. Ideal for stacks and rolls of paper products and warm running rolls and stationary cold rolls. Infrared temp sensor and optional bluetooth for data transfer. P2 is a digital paper moisture meter used primarily for kraft paper, brown paper, wrapping paper, packaging paper, cardboard and paperboard. This easy-to-use portable handheld paper moisture meter takes quick and highly accurate nondestructive measurements of paper moisture. RH5 is a penetrating, nondestructive, capacitive absolute moisture meter used to measure temperature and moisture in reels, stacks and piles of paper or cardboard. Featuring data logger and PC interface capabilities, this high-tech paper humidity measuring device measures relative humidity from 0 ... 100% rh, temperature from -10 ... 60°C / 14 ... 140°F, and dew point from -55 ... 60°C / -67 ... 140°F. Affording a large graphic display and multi-language menu, the easy-to-use RH5. FME is a handheld paper moisture meter for accurate measurement of the moisture content of paper, wood and building materials. The moisture meter features preset characteristic curves for material-specific moisture measurement. To detect moisture, the moisture meter requires external sensors (sold separately - see accessories) that can either be inserted into a material or placed on a material's surface, allowing for either destructive or non-destructive measurement. The FMD 6 is a handy and versatile paper moisture meter for reliable measurement of the moisture content of paper, wood and construction materials. The paper moisture meter has preset characteristic curves for the moisture measurement of specific materials. 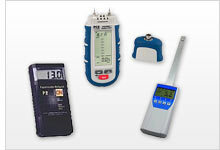 The moisture meter needs external sensors (sold separately - please see accessory list) to operate. The sensors can be positioned on the surface of a material or inserted into a material, thereby permitting either non-destructive or destructive measurement.